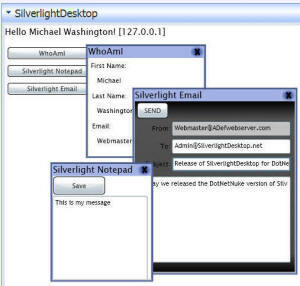 SilverlightDesktop for DotNetNuke has been released. This version of SilverlightDesktop uses the exact same Silverlight core project as the stand-alone version of SilverlightDesktop.net. 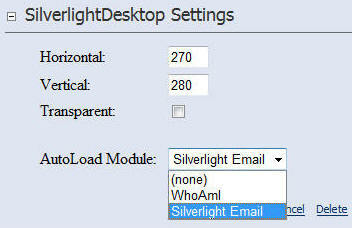 Each instance of SilverlightDesktop has it's own Settings. Settings provide the option to display the normal SilverlightDesktop interface or a single module by selecting it in the AutoLoad drop-down. Portal administrators are provided endless configuration possibilities. You can read documentation to make SilverlightDesktop modules at this link. IMPORTANT - You must add keys to the web.config before uploading the module. See this link.